Customs protection of intellectual property rights is an effective way to protect the interests of the right holders. Through similar ways of customs training or customs recordation, we can interact with the customs, and help the customs to improve the brand awareness and sensitivity of the customs effectively. 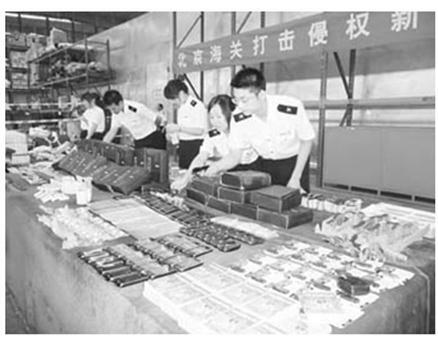 REGENT has been providing diversified services of customs protection for a famous international game manufacturer, including a series of IPR customs recordation, participation of custom trainings actively, and follow-up of suspected infringing products seized by the customs, to intercept the infringing products in China borders. In July 2009, the Beijing Customs’ agency in the post office received an express which was dispatched from the inland customs for export. According to the detail bill for this express , it indicated this shipment contained 75 boxes, each weight 30 kg, the destinations were ten countries from South America and Europe. The declaration of the items includes: digital parts, digital cards and electronic parts etc. However, after unpacking and checking the goods, it was found that the actual goods were electronic products including mobile phones, game cards, USB disk, computer memory and all kinds of electronic accessories, trademark labels and so on, 54,762 pieces in total. Upon investigation, the Beijing Customs affirmed that the above-mentioned products constituted infringement and shall be detained in accordance with the law. REGENT’s representative rushed to the spot immediately in the acquisition of the notice, learned the details of the case, took photos on-site, and reported the case to the right owner promptly. According to the statistics, 85 pieces of suspected infringing game machines were seized on site, as well as 2,377 pieces of labels and related accessories. In view of the large value involved in this case, Beijing Customs notified the related information of this case to the public security organization for further disposal. At the same time, because of its wide influence, the case was elected as one of the top ten cases of Chinese customs protection of intellectual property rights by the General Administration of Customs in 2009. The significance of this case is to hit heavily on the illegal activities that use the express and mail channel to import or export infringing goods by batches.